This work focuses around the theme of loss and death. 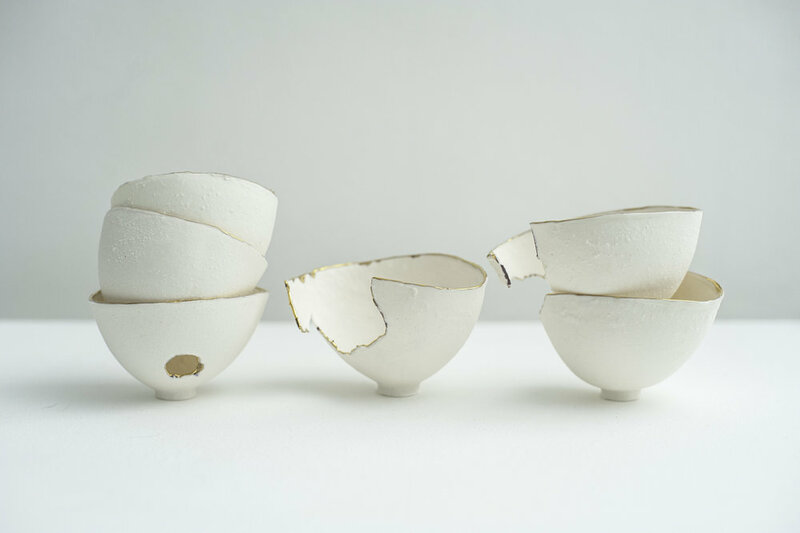 Porcelain objects or containers are used to convey a metaphor of fragility and signify the care we bestow on the ones we love in a most essential way. It reflects this expression through form, condition, positioning and as an installation of 267 objects, to correspond to the number of days my partner survived from diagnosis to death. The predominant characteristic of ceramics – fragility – has been used as a strategy to make reference beyond function although in this work, there is still a suggestion to the domestic. The fragile characteristic of fired clay provides a reflection on the precarious nature of human existence, using the very fragility of this material its subject matter. My work explores the futility that can be experienced during those periods of palliative care and end of life days. This has been represented with many of these vessels that are presented, as broken and their precarious placement. This placement and the fragility associated with porcelain is used to represent a state of extreme tension that can threaten a sickening inevitability of impending destruction.